Between August 12 and 14, thousands of working families were displaced following severe flooding in Louisiana, including up to 900 Teamster members. 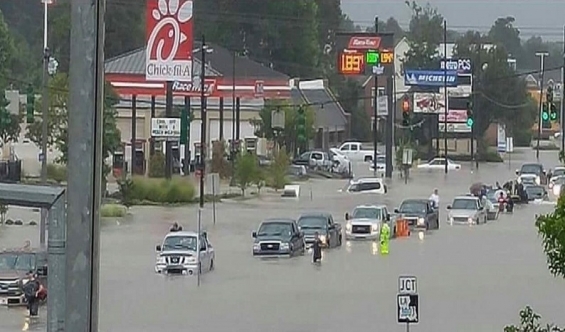 By the time the storm was over, more than four trillion gallons of rain had fallen, setting an all time record high for southeast Louisiana and leaving approximately 20,000 people without food or shelter. Despite little national news coverage being given to the devastation, the Teamsters Union has been on the ground providing aid to those in need and raising awareness. The IBT has a long tradition of serving on the frontline in times of crisis and helping members affected by natural disasters. Currently, a number of members of Teamster Locals 5, 270 and members of the BLET and BMWED, have lost their homes and need our help. Roy Gillespie of the Teamsters Human Rights and Diversity Commissioner, and member of Joint Council 13, is currently on the ground assisting those in need. He is calling on members and locals from across the country to take action and support their brothers and sisters in Louisiana. The Teamsters Disaster Relief Fund is working closely with local union officials and the Red Cross to ensure that every Teamster member who was impacted by the flooding and FEMA approved receives a contribution from the fund. To donate to the Teamsters Disaster Relief Fund via debit or credit card, follow this link: https://teamster.org/benefits/disaster-relief.